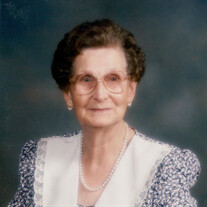 Our Mom was born Anna Violet Striemer, June 16, 1926, one of fifteen children to her family. She grew up on the banks of the Saskatchewan River at Hague, Saskatchewan. Her father was the ferry operator and he and her mother were also gardeners raising produce for the family. Mom's early formal education was poor at best -- she spoke of three partial years of going to German School, learning some English at a Summer Daily Vacation Bible Camp, and of intentionally studying cans and boxes to make grocery lists in order to learn to read English. By the time she was eight years old she was hired out as a chore girl in exchange for room and board, and an occasional dress. I'm told by the age of twelve she was working fulltime for several different families as a maid, which arrangement lasted for a number of years. While working for Dad's sister, Annie, my Mom met and fell in love with the man she would later marry, William Giesbrecht. During their early years, they lived in Laird, and Dad ran a Livery. They bought a farm nearby and began farming and of course, we came along, at least the first four of us. During this time immediately after the war, the Peace Country was being opened up and homesteaded, and it wasn't long before our family was off to BC on an exploratory trip, first to check things out and then to stake out their own homestead. Along with quite a few other friends and relatives, five of Dad's brothers were part of this exodus - hence the number of Giesbrechts in the area. How they ever found and settled the country they chose, or even located the first survey pin in a land so covered in bush and timber, I can hardly imagine. Pressing past the recently settled farmland just north of the Peace at Clayhurst, they pushed a trail diagonally across country, beyond a largely Ukrainian community, and spread out in the Flatrock Valley. Mom was pretty shocked when she learned she would be living in a tiny log cabin for the first while - the mice being one of her main concerns. Mom was the first white woman to settle in the valley. Life was tough and very lonely for her in those first trying years. Imagine her delight when two of Dad's younger brothers married and brought their wives to settle and become her close friends and confidents. The difficulties these young women faced were numerous. Travel was treacherous, and at times impossible. The land being so new, was reluctant to yield good gardens in the first years. Flocks and herds had to be established, buildings had to be built, washing clothes(white had to be white) was an all-day affair ending in bloody knuckles and all this without the amenities we deem essential and take for granted nowadays. Even such an essential such as water had to come from melted snow in winter until dugouts could be built and filled. To compound these tough pioneer conditions, our valley had the misfortune of a raging forest fire in 1950 that burned through the new community destroying everything in its path - equipment, fences, cabins, and outbuildings, even our chickens strategically placed out on fallow land were torched. When the smoke settled, and Mom and Dad returned to resume their life, they converted a granary for us to live in temporarily and later that fall we moved into a log cabin up north at the brothers' sawmill site. Probably due to the stress and strain of needing to be in the care of the Red Cross and with Mom's pregnancy at the time, she became ill and was actually separated from us kids for a number of months. Unfortunately, poor health was to dog Mom for quite some time and with it came depression and anxiety. Who could imagine?! The rigors, physical and emotional, began to take a heavy toll on Mom, and in the following years Mom would suffer two nervous breakdowns. Further compounding these local stresses, when her own Mom passed away, the 'news' reached our family a week after Grandma had been buried; nor was she to attend her own father's funeral - she was being hospitalized at the time. This difficult part of Mom's life notwithstanding, Mom was an overcomer. She was a miracle worker, though perhaps she experienced more miracles than ever she initiated. We remember her as a homemaker extraordinaire! There were no excuses for lack of organization or cleanliness in our house. She was resourceful and creative in decorating her home. She was able to sew beautiful dresses and crochet doilies without needing a pattern. Mom became a voracious reader, and you could always find a puzzle on-the-go on a table somewhere in her house. Because of the large gardens she would plant, her larder was always sufficient - through every season. Mom really was a good hostess and a very fine cook and loved to put on family meals. Mom's hospitality translated into helping others less fortunate than herself many times. We were able to share garden surpluses with poor neighbors. Mom was able to show love to so many including her daughters-in-law when they came along. She was "Mom". Mom lived her life by prayer. She often said she could do nothing without it. We are glad to have been the recipients of her prayers. As a much-extended family, we have experienced numerous miracles - in terms of health, safety, miracles in other's lives and so on. When Dad passed away (so many years ago now) Mom had a house built for herself and moved into Fort St. John. After five years of living by herself she did a rather 'Biblical' thing and married her widowed brother-in-law, our Uncle Ernie. This was a precious quieting time in her life when Mom really became a grandma to my own kids, as well as many of her other grandchildren being born at that time. She and Uncle Ernie continued to be doting grandparents to a whole new set of families. To host a Christmas get-together, I remember using the church gymnasium to accommodate our newly blended family and at another time we had seventy-five people in our house. Summertime barbeques simply flowed into the out-of-doors. I was (and still am) so amazed at how lovingly Uncle Ernie's family treated and accepted Mom during those years of adjustment for them. Mom and Uncle Ernie had ten wonderful years together. After Uncle Ernie passed away, Mom decided it was a perfect opportunity to move back to Saskatchewan to reacquaint herself with her own aging family which she had left so many years earlier. Once in Waldheim, she showed her entrepreneurial side, and bought and sold a number of houses. We're not surprised Sears has gone into receivership since Mom stopped completely outfitting her houses from the catalogue! She was a woman ahead of her time - a true pioneer of online shopping! She always loved to sing, and joined and travelled with her local church choir, fulfilling one of the desires of her heart. Even as we sat with her these last few hours and sang hymns to her, we watched Mom softly mouth the words with us. Once again, living by herself lost a certain lustre. Mom accepted a proposal and married Aaron Fast, her late sister's husband. Mom's extended family of loved ones expanded yet again to include even more children and grandchildren. Uncle Aaron was very kind and attentive to Mom, and even when they eventually had to live apart due to his care requirements, he still lovingly called her every day until he passed away. In 2009 Mom's health took a serious turn for the worse. Because it was Mom's wish to spend her final years close to her immediate family, we brought her back home to Fort St. John. She spent the next three years living with Ken and Marleen before moving into Heritage Manor and finally into Peace Villa. We are deeply indebted to the staff of both of these care facilities for their wonderful loving care of Mom, particularly as she began to fail in her final months. Mom's faith in God was always evident through her prayer life and in her acts of service, even to the very end.